There are many opportunities for wildlife viewing. Wells Gray Park is 5000km² – a beautiful, pristine wilderness reserve. To provide some perspective, Wells Gray Park is as large as, or in some cases larger, than one in every five nations on earth! Due to its size, location, and its unique volcanic and glacial history, the park has a rich biodiversity that boasts 219 species of birds, 56 species of mammals and over 700 species of flowering plants, 275 bryophytes, 500 lichens and 200 microfungi! The list is growing each year! The best way to see wildlife is to keep your eyes open as you drive into the scenic Wells Gray Park. Bears, deer, and small animals such as coyotes and foxes are often sighted alongside the road. Patience is key! 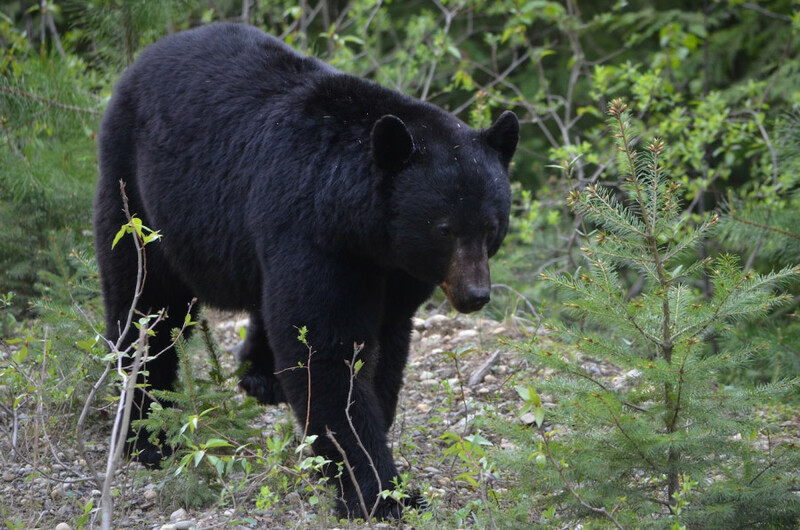 Black Bears are most common below the tree line, but are often found in montane woods. With an average height of 95cm at the shoulder and 168cm in length these guys can weigh up to 200kg, with females usually being about 1/3 smaller. Bears are not always black, they can be a reddish/brown colour – these are known as cinnamon bears. One of the most interesting facts about the black bear is that 75% of its diet is vegetarian. 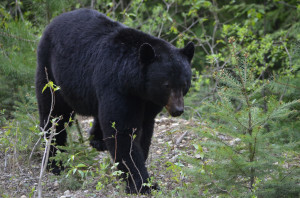 During the spring and summer bears will eat sprouting plants and the inner bark of shrubs and trees, (high in sugar and protein) and during the fall they will eat berries and fruit. Carrion accounts for 10-15% and insects – 5-10%, while fish and other small mammals about 1%. Pretty interesting don’t you think? Mating occurs late June and early July, however there is a delay in the implantation of the embryo. This is delayed until the fall to ensure the female has enough stores to see herself and the cubs through the winter. Another fascinating aspect of the Black Bear is their hibernation process. You would think that their body temperature would drop significantly to sustain the long winters. However, the Black Bear’s normal body temperature is 38°c and it drops only to 34° -31°c. This is to keep their muscles warm, and provides the ability to be active quickly if need be. This takes a lot of energy and costs the bear about 5000 calories a day ….. without eating or drinking! How do they do this? By not only having large fat reserves but also having the ability to convert their own urea (a by product of metabolism activity that converts into urine) into proteins. This process also helps with removing toxic build up and maintaining body mass. White-tailed Deer can be found all over the park and are identified by their reddish-brown summer coat and a grayish-brown winter coat. When the deer runs away it normally flips its tail and reveals its white under coat – and hence its name! Shoulder height is normally about 100cm, with a weight up to 130kg. Their antlers point forwards, with tines that point upwards. 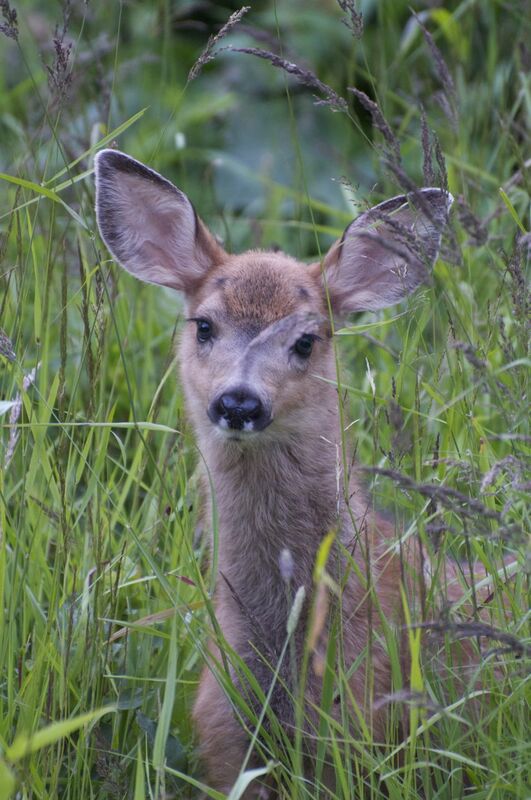 These deer eat mainly grass, wildflowers, and leaves in the spring and summer, and during the winter season they browse on twigs, buds of shrubs, aspens, poplars, evergreens and lichens. Their antlers begin to grow in May and reach full size in 140 days in time for rutting season in September, and are dropped off in December. They mate in mid November and deliver in late May and early June and have a gestation period of about 210 days. 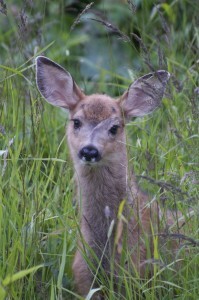 Fawns are reddish-brown with white spots – and are great camouflagers. They can lie incredibly still when need be, while the mother hides each fawn under tree bows and feeds one at a time. Another protective element of the fawn is that they have no smell, and predators walk right by them without even detecting their presence! They stay with their mum for about 4 months and are then on their own. Males will grow their first set of antlers in their second year. Rutting is a breeding behavior that takes place in the fall. Here, huge doses of testosterone are released in the males blood stream, causing their necks to swell. They also become very aggressive during these weeks. Males will walk around sniffing the females urine puddles by curling their lips to stimulate an organ called the Jacobs organ located in the upper palate. This organ helps them sense estrus better. They rub their antlers against trees and leave their scent via glands on their faces. The males, will spar with each other clashing their antlers together and shoving each other back and forth. These acts are to reinforce hierarchy. Although they spar casually throughout the year, spars during rutting season are fights that can produce serious life threatening injuries! What happens to all those antlers? If deer, elk, moose and caribou all grow and discard antlers – the woods would be full of antler right? Well, no, and here’s why. Antlers are made of bony material that takes years to break down, but snowshoe hares and other small rodents gnaw the antlers for the rich minerals they contain. Since rodents and snowshoe hares are near the bottom of the food chain – there are a lot more of them than deer! These are the third largest birds in the surrounding area and the Canadian Rockies! They have a wing span of up to 203 cm and are about 82cm high. They can be found along rivers and lakes, and are easily identified by their brown and white plumage. They mostly feed on fish but also eat carrion and will capture rodents and small waterbirds. 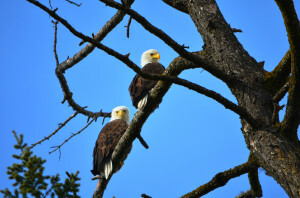 Bald eagles breed in mid spring. This is a great time to watch out for these eagles as their mating behavior often sees them locking their feet in mid air and tumbling to the earth, releasing at the very last moment! They lay and hatch two eggs, however one chick will often starve the other by taking its food or even killing it. It will leave the nest within about 10 to 11 weeks of being hatched.